Rhizomes shallowly set, 1-1.8 cm thick. Stems erect, 5-9(-11) dm; sheathing bract cauline, papery, caducous. 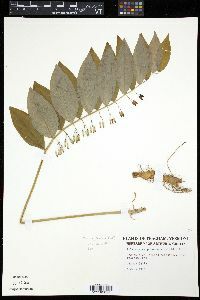 Leaves subsessile or short-petiolate, 4-15 × 2-5.5(-7.5) cm; blade elliptic-lanceolate to broadly ovate, glabrous adaxially, minutely hairy or pilose on abaxial veins; prominent veins 3-9. Inflorescences in most leaf axils except distalmost and proximal 2-4; peduncle sharply reflexed, axillary 1-3(-5)-flowered, to 2 cm in fruit. Flowers: perianth yellowish green, tube 10-13(-15) mm, distinct tips 2-3 mm; stamens inserted high in perianth tube; filaments densely warty; pedicel to 1.3 cm in fruit. Berries 6-9 mm. 2n = 20. Flowering early--late spring. Rich moist wooded slopes and coves; 0--1100 m; N.B., N.S., Ont., Que. ; Conn., Del., D.C., Ga., Ill., Ind., Iowa, Ky., Maine, Md., Mass., Mich., Minn., N.H., N.J., N.Y., N.C., Ohio, Pa., R.I., Tenn., Vt., Va., W.Va., Wis.
Perennial herb with a knotty, creeping rhizome 0.5 - 1 m tall Stem: upright. 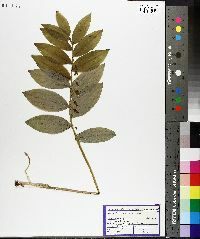 Leaves: alternate, short-stalked or nearly stalkless, 4 - 15 cm long, 2 - 6 cm wide, narrowly elliptic to broadly oval, parallel-veined, hairy on the smaller veins beneath. Flowers: yellowish green, 10 - 13 mm long, tubular, with six short lobes. Stamens six. Fruit: a berry, dark blue to black, 6 - 9 mm long. Inflorescences: are short clusters (racemes) of one to three flowers hanging from the leaf axils. Similar species: The similar Polygonatum biflorum differs by having hairless leaf undersides. Habitat and ecology: Frequent in moist woods and thickets. Notes: When the leafstalk is broken away from the rhizome, the rhizome will show a distinctive scar that is said to resemble the official seal of King Solomon. Etymology: Polygonatum comes from the Greek words polys, meaning many, and gonu, meaning knee-joint, in reference to the many joints of the rhizomes. Pubescens means downy. Frequent in moist, rich woods in the northern two thirds of the state, becoming very rare in the southern part. 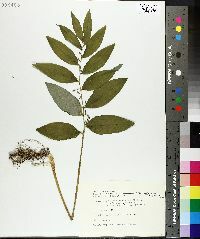 I have 86 specimens of my own collecting from which I made this study.